A clean mouth is a key component to a healthy hound. We offer a full line of Tropiclean Fresh Breath oral care supplies, including gel toothpastes, toothbrushes, liquid floss, and water additives. Or try the Leba III oral spray… it’s proven to clean teeth in just 28 days and is the staff pick! 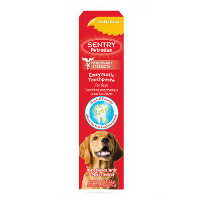 Greenies dog treats are also available, and are vet recommended for a total oral health solution. 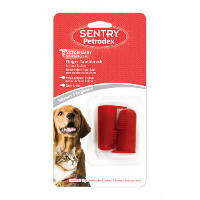 Or browse through the variety of other products we have in the dental section of the pet department. 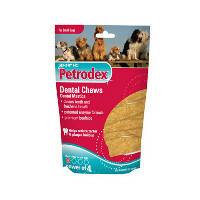 The #1 veterinarian-recommended dental chews and clinically proven to provide a total oral health solution. NUTRITIOUS INGREDIENTS GREENIES’ Dental Chews are naturally made with added vitamins, minerals, taurine, and chlorophyll (sodium copper chlorophyllin) to provide a complete oral care, and offer a nutritionally complete and balanced blend of highly soluble and digestible proteins for adult dogs based on AAFCO recommendations. UNBEATABLE TASTE If you or your dog isn’t 100% satisfied, you’ll receive your money back. Guaranteed. 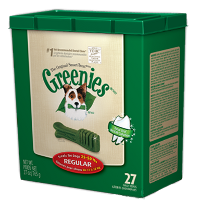 NOTICEABLE DIFFERENCE GREENIES’ Dental Chews are clinically proven to clean dogs’ teeth by fighting both plaque and tartar build-up, freshening breath, and maintaining healthier teeth and gums. Also available in Lite and Senior formulas. 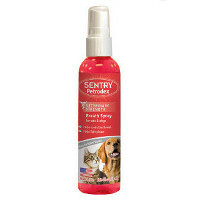 Petrodex Breath Spray is a convenient way to control tartar. Spraying onto teeth and gums penetrates between teeth to clean the entire mouth. 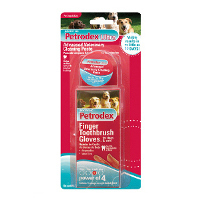 Petrodex Toothbrush is specifically designed for the pet’s mouth. Brushing is the most effective way to clean your pet’s teeth at home. A unique patent pending formula paste that adheres to the pets teeth for up to 24 hours. Breaks down tartar and plaque, has effects below the gum line to improve gum health. Combined with Petrodex finger brush glove for easy application. 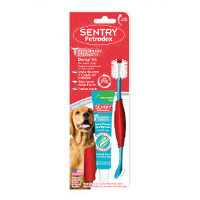 • Petrodex Toothbrush is specifically designed for the pet’s mouth. • Brushing is the most effective way to clean your pet’s teeth at home. 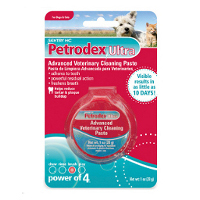 Petrodex Dental Care Kit Dog Poultry Toothpaste w/Toothbrush helps control plaque and fights bad breath. 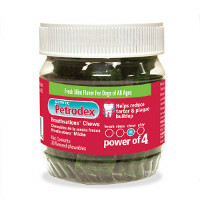 Petrodex Enzymatic Toothpaste is formulated specifically for pets. Helps control plaque and fights bad breath. 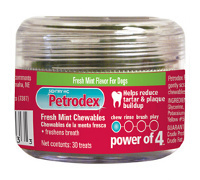 Petrodex Dental Chews are treated with a patented dual enzyme that activates the body’s natural defense system killing plaque forming bacteria. 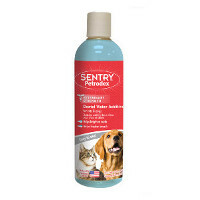 This easy-to-use additive for dogs helps keep water fresh while whitening teeth and freshening breath. Chlorhexidine and zinc gluconate provide strong antimicrobial benefits and help reduce accumulation of plaque and tartar. Patented technology to reduce tartar and plaque by gently scraping the teeth clean and reducing bad doggie breath. Easy bite size chewables for dogs.